It is an honor to nominate the Rocky Mountain PBS StoryMakers Contest for the Community Development Award. The mission of Rocky Mountain PBS is to enrich the lives of Coloradans through engaging and essential programs, services and community partnerships that inform, enlighten and entertain. The means to achieving this mission is storytelling -- whether it be on-air, on-line, or via social media. We are story tellers of artists, musicians, history, culture, current affairs, scientists and our Colorado community. 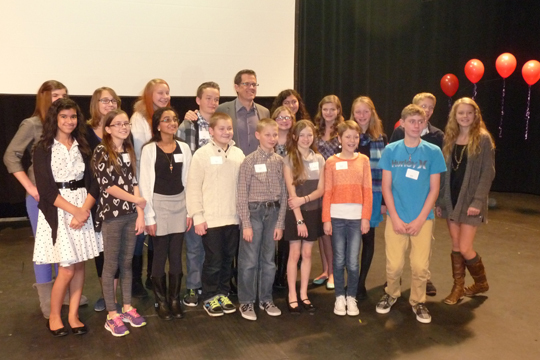 To the point that the art and ethics of storytelling must be passed form one generation to another, Rocky Mountain PBS created StoryMakers, a statewide short story (fiction) contest for 6th, 7th and 8th graders. Now in its 8th year, StoryMakers (www.rmpbs.org/storymakers) is organized and run by dedicated volunteers with the assistance of staff and funding from CenturyLink. Students throughout the state submit stories, volunteers judge the stories, finalists participate in a day-long workshop and are honored at an awards luncheon. In the past 8 years, over 6,000 stories have been submitted from all parts of the states -- from public schools, home schools, charter schools and online schools, 192 students have been recognized at awards' luncheons and participated in day-long workshops with noted authors and journalists. Volunteers manage and run StoryMakers. Reaching out to Colorado schools and teachers, coordinating entries, judging stories (approximately 750/year), planning the workshop and organizing the awards luncheon takes 50+ volunteers. StoryMakers would not be possible without the work of these dedicated and thoughtful volunteers. They ensure that the voices of children are heard and that the art of creating narrative continues! In 2014, Rocky Mountain PBS partnered with Lighthouse Writers Workshop (www.lighthousewriters.org) to present the day-long workshop. Lighthouse Writers Workshop is the largest nonprofit literacy center in Colorado and the Mountain west offering high quality writing instruction in poetry, fiction,nonfiction, screenwriting and many other genres. In addition to the partnership with lighthouseWriters Workshop, Laura Frank, President of I-News at Rocky Mountain PBS presented at the workshop on the tools necessary to the art of storytelling from the perspective of an investigative journalist. Ms. Frank is a Denver native who spent twenty years at newspapers, radio and public television around the country, specializing in the in-depth reporting that requires data analysis and deep public records research. She has trained hundreds of journalists for more than a dozen media organizations, including the nation's largest newspaper company, Gannett. her work has been recognized in both broadcast and print, including a regional Emmy for documentary production in 1990 as a top-10 finalist for the 2007 Pulitzer Price at Rocky Mountain News. StoryMakers gives voice to youth in Colorado. It is an extraordinary insight into the minds of our young people and the personal challenges that they face. The stories of these young writers inspire all. We, at Rocky Mountain PBS, take the responsibility of encouraging and mentoring our youth very seriously. As author Maya Angelou stated, "There is no greater agony than bearing an untold story inside you." The positive impact of StoryMakers is, perhaps, best reflected in this testimonial from one of the parents: I want to thank you for the rocky Mountain PBS StoryMakers program. My daughter took part in the competition and was a runner up for the 8th grade group. The whole process was so thrilling for her to be a part of. When we were at the studio for the celebration in January, she told us she felt like a movie star. She loved the workshop but most of all I think she loved the fact that so many people were involved in the whole process and that most were involved through volunteering. She was so inspired . . . Our children need to feel important in order to succeed and every small step counts. This support needs to be more than just parents and teachers. When our children see other adults and important people involved in their futures, it paints a bigger picture for them. Thank you for painting part of this bigger picture. Thanks goes to National Friends of Public Broadcasting for providing Rocky Mountain PBS the opportunity to recognize StoryMakers and the volunteers, young writers, their parents and teachers who make this program possible. View the video of the Award Presentation to RMPBS STORYMAKERS CONTEST.